This is the second time in a month, and the eighth time in his career that Ben has been awarded this honor! Ben Roethlisberger was named AFC Offensive Player of the Week after leading his team to a 25-17 victory over the New England Patriots. It marks the second time Roethlisberger has won the award this season, including twice in the month of October, and the eighth time he has been honored with this award in his career. Roethlisberger finished 36-of-50 for a season-high 365 yards and two touchdowns against the Patriots, recording his third 300-yard game of the season and the 18th of his career. His 36 completions and 50 pass attempts were the second-most of his career. 2. 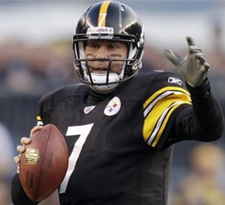 Ben Roethlisberger, Steelers: If there’s a quarterback big enough to put an offense on his back, the 6-foot-5, 241-pound Roethlisberger is him. The two-time Super Bowl champion has been lethal his last four games, throwing for 1,154 yards, 11 touchdowns and two picks, with a 67.1 completion percentage and a 110.4 passer rating. More impressive, he’s playing with poise and discipline, things he struggled with at times in the past. Not surprisingly, the Steelers have won four in a row after a 2-2 start. Brittany was a contestant in the Miss Maryland USA pageant which took place this past weekend in Bethesda, Maryland. *Congratulations to Brittany aka Miss Amity 2012! Have you seen the latest additions to the Fans album? How about the Lil’ Fans album? Or the new Lil’ Teammates album? Did you check out the photos that Ben sent on Halloween night?